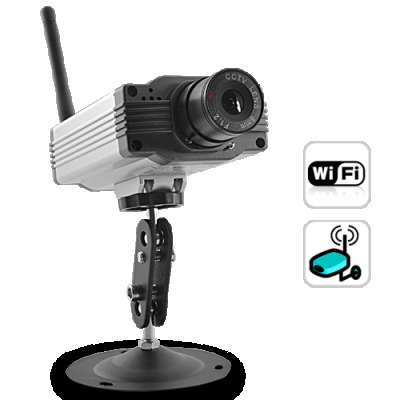 Successfully Added Wired / Wireless IP Security Camera with Motion Detection (WIFI, Ethernet) to your Shopping Cart. The ultimate IP security camera that comes with motion detection alarm recording function has arrived. Monitor and record from anywhere in the world. Are you worried about security? Then we have found the perfect peace of mind gadget available in the market today. This is an IP security camera that has it all. Once you are logged in, you can manage an array of functions and change, modify, implement, view, and do so much more than just sit and watch. This model provides true versatility in its applications with Wi-Fi enabled and the additional option that allows this smart IP camera to alert you via email when the motion detection record function is activated. Create your own 1984 Big Brother paradise with this amazing IP Security Camera. Whether you're at an airport or a coffee shop, or you’re in Hong Kong, Paris, London, Barcelona, California, Moscow, Timbuktu etc, you’ll be able to check the security status of your home or business from any computer in the world that has an internet connection. Use this new Wireless IP Camera to enjoy high quality, live video surveillance on your computer or security monitoring station. Anyone can appreciate a cost-effective and high quality device to protect their interests, and this IP camera is ideal for homes, small businesses, restaurants, corporate IT, entry areas of sensitive labs, secret underground bunkers, evil headquarters inside volcanoes, and many other places. It is extremely easy to setup and use this IP Security Camera. Simply plug in, install the software and the included program will find the device and let you open and view the camera’s feed from your browser. This great product is a no-nonsense security camera solution that you can access anywhere in the world. This powerful smart IP security camera with motion detection recording is in stock now, and available to you at a factory wholesale price. Click "add to cart" now and we will express ship out your order tomorrow. Good for dropship sales as well as internet storefronts.